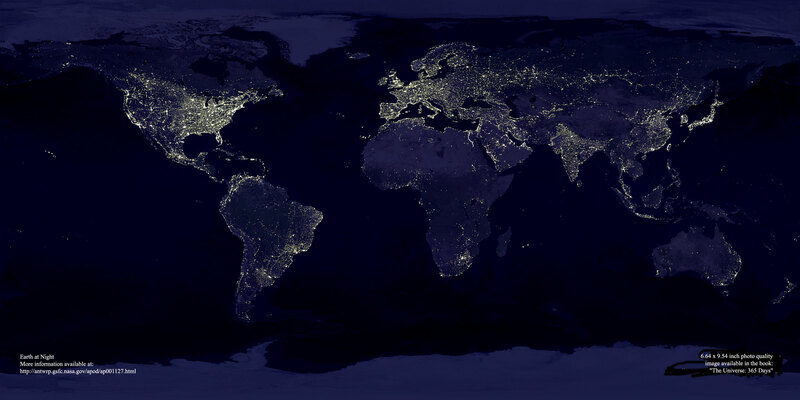 The earth at night, as photographed by NASA. You've got to see this! Discussion in 'Archived Threads 2001-2004' started by KeithH, Sep 7, 2001. I saw that before, it really puts things into perspective. I really wish more pictures were taken like that, but who knows how much money was involved for that to be taken? I can only dream how the earth looks in space compared to the other planets. Or I can pick up an IMAX DVD. The NASA channel is one of the best during flights. It has live feeds of pic and daily activitys. When on the big screen it makes for a great event. I've had that image as my desktop background at home and at work since it was posted on the APOD. It is effing amazing. Same as Kolya; I've had that as my desktop (albeit a bit altered for best effect) for quite some time. I saw the image and knew it had to be my wallpaper. Thanks for the link. Great photo. No problem. Glad to do it. I downloaded a copy of the picture and have it on my desktop too. It's too bad NASA is not selling posters of it. They would sell many of them. I know I'd get it framed and hang it up in the den. Wow, 'great wallpaper' was the first thing that popped into my mind!!! A poster would be mint. It reminds me when I was 15 and saw on the TV that guy standing in front of the 4 tanks at Tiananmen square and I said to myself If I ever see a poster of that I'll be buying it. A few years later at the largest shopping mall in the world I saw it and it has since been the centerpiece picture of the room. spaceshots.com has some good earth/space posters. They have one similar to the topic picture, but with some extra crap at the bottom. I saw it, and bought some others, at Pier 39, in San Fancisco. Probably everybody has a waterfront estate, hehe. The thing that surprised me, and this is in no way intended to be derogatory, is how lit up India is. I would never expected that. I am not in any way saying that I thought of India as uncivilized, but I would not have expected the concentration of light there that the picture shows. 1. Breathtaking- imagine zipping by all the other planets, and then passing this one! As an interstellar traveler, you'd have to stop. 2. Saddening- it's a reminder of the over-use of natural resources, and the main reason I can't see many stars at night. You should see the night sky from the top of a submarine in the middle of the ocean on a clear night during the new moon. Truly breathtaking! The only thing I would have liked was that they would be closer to the equator.